Supercross is an experience on its own. While it does make use of motorcycles, the road travelled is completely different to that in MotoGP. The cycles are the off-road variety and the tracks are not tarred but made up of dirt. You may often hear of Supercross referred to as SX. The tracks on which the Supercross events usually take place consists of artificial dirt. The tracks are manipulated to encompass many obstacles and steep jumps in order to test the riders abilities and push them to their limits. The motorcycles are designed to endure the most extreme terrain while still being powerful enough to drive the rider to the finish in fine time. As with any sport, there are teams which frequent the events and have become synonymous with the sport. Honda Muscle Milk, Joe Gibbs Racing, Monster Energy Kawasaki. Rockstar Valli Yamaha and Red Bull KTM are only a few of the many dominant teams on the circuit. The teams participate in three classes or race distinctions. 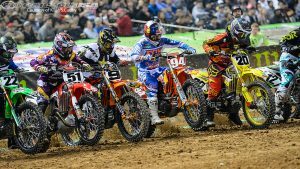 Supercross class is for the big guns, however, skills and talent cannot be taken from the riders in the Supercross Light East and Supercross Light West divisions. Between the years of 2003 and 2012, the Americans have dominated with all except one champion hailing from the States. It is only Chad Reed from Australia who has broken that trend. Fitness is a huge factor when it comes to racing of this sort. The body is put through its paces over terrain that is unpredictable on a bike that is extremely heavy. Stamina is required to go the full distance of the track. The physical exertion differs considerably from riding on a tar road. Most riders practice every day for at least a few hours in order to perfect their skills. Comfort on the bike is paramount and only time spent riding can deliver those results.